This is a real image of a marine amphipod without any fancy photoshop tricks. Understanding these diamond-like patterns will require knowledge about polarized light and the role of polarized vision in marine invertebrates. When light reaches our eyes we detect wavelength (color) and wave intensity (brightness) information. That is exactly what the brain needs to build a visual picture of the surrounding world. Yet a lot of other information is left out. UV and infrared parts of the spectrum are the most obvious examples. Well, technically the human retina is sensitive to UV, but the eye lens filters it out. That is why individuals missing eye lens, for example due to cataract surgery, can see UV light. Some parts of infrared waves can be sensed by the skin as heat, which is how we can estimate whether a frying pan is hot or not. These features, however, don’t make up for the limitation of our vision. Aside from having a very narrow spectral sensitivity, we can’t detect light wave oscillation direction. This is another parameter of a wave in addition to wavelength and intensity. In the majority of cases each individual wave vibrates in a random orientation in a natural beam of light. But there are many natural exceptions that can be useful. This is why many types of invertebrates, birds, and fish found another visual world by means of enabling themselves to sense additional dimension of light—polarization and its angle. 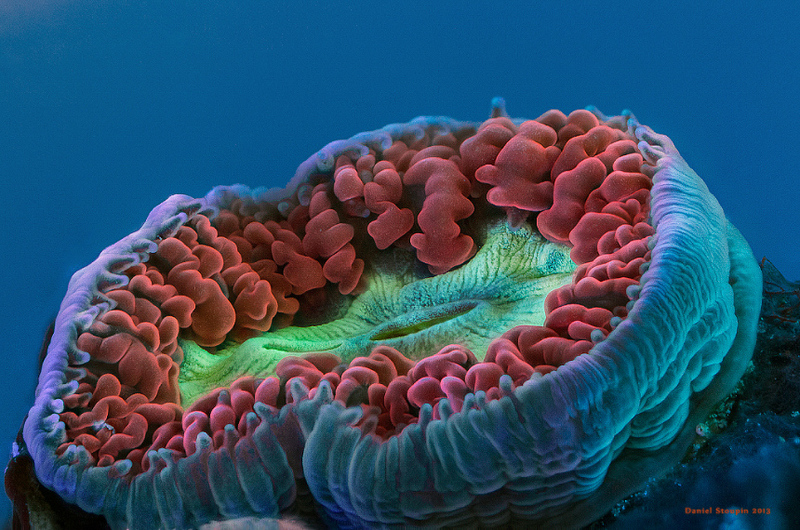 Corals, like many representatives of marine life, are known to be strikingly colourful creatures. However, understanding the nature of those colours can be tricky. The most problematic part: there's no such thing as colour outside your head. Light differs in wavelength and those differences can be picked up by various receptors in the eye. Colours, in contrast, are born in the secondary visual cortex in the brain after a lot of information is processed. The brain decides how to render the information from the retina based on the context of the whole image. In other words, there's no easy correspondence between wavelength and colour. Every photographer is familiar with this concept as part of white balance correction. This is a lacy scorpionfish (Rhinopias aphanes). It's extremely rare and I know only one diver with 5000+ logged dives who have seen this gorgeous creature in its natural habitat. I guess that makes me fortunate to be able to see it, at least in an aquarium. 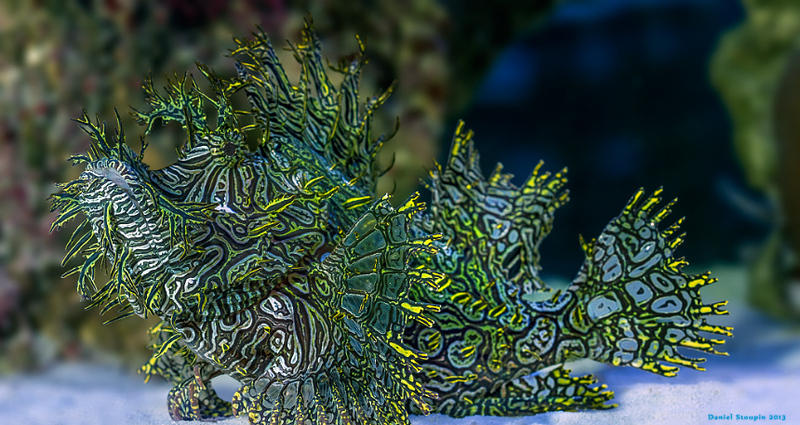 Unfortunately for this psychedelic fish, its beauty makes it very desirable among aquarists. In addition, it is so confident in its perfect camouflage that it simply doesn't bother to hide and sits in the most visible place of the tank. Most likely it also doesn't try to hide in its natural environment either and divers just miss it. The Great Barrier Reef is renowned for amazing underwater sights... but the weather might seriously let you down. I spent most of the two-week long field trip indoors cursing the weather, yet managed to get a few shots. The field trip took place at Heron island, which is a large coral cay. University of Queensland has a research station there. The picture above might look like something coming straight from my camera attached to my microscope, but don't be deceived. That's just bubble coral from the Indian Ocean and not even a macro shot. 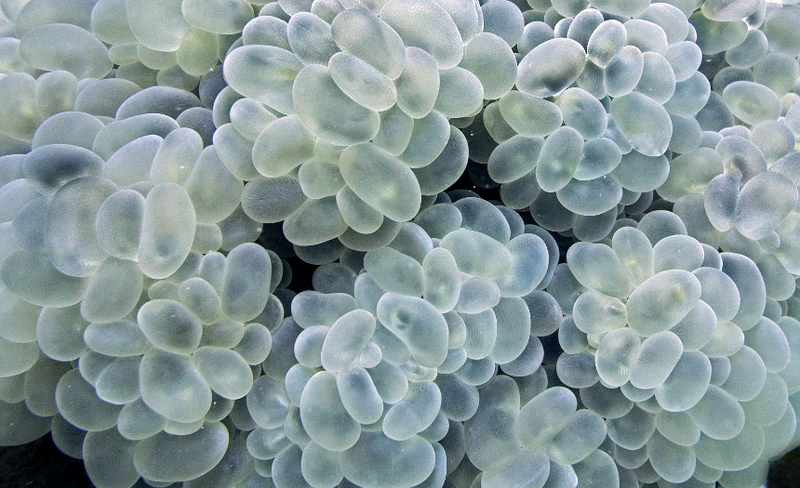 One of divers' mottoes is "take nothing but pictures, leave nothing but bubbles." But do divers really leave reefs unharmed? 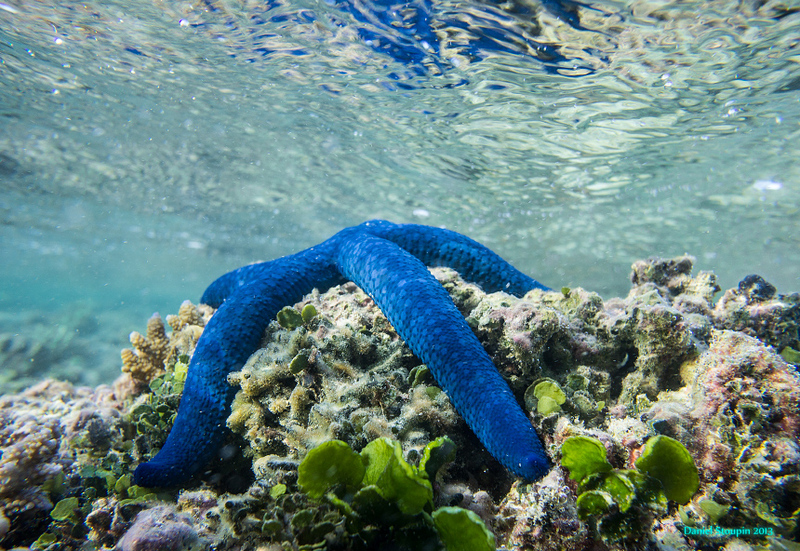 Being a biologist with reef conservation experience made me see my vacations differently. While everyone seems to come to tropical destinations to enjoy water activities, spend time on sunny beaches, and look at colorful fish and corals, I automatically start evaluating reef damage and looking for coral diseases. The last trip to Thailand made me question such things as whether or not conservation biologists are pessimistic in general or is it just me. I also started wondering if it's possible to come to a place without harming its environment, particularly if you are a diver. Most of small and microscopic invertebrates are transparent and sometimes make you feel that they are made out of glass. That fact makes taking pictures very difficult. 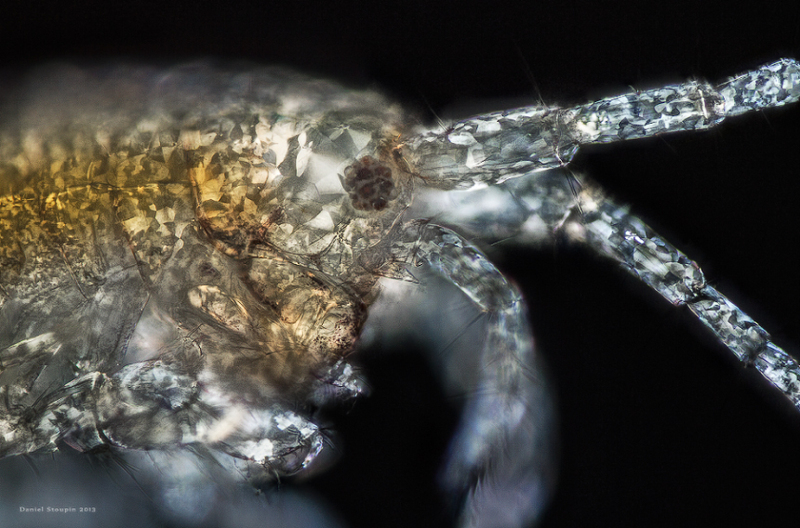 In case of this water flea, which happens to be Simocephalus vetulus, I spent 4 days by Photoshop manually stacking and stitching images and cursing all classes, orders, and families of crustaceans I could recall. No automatic software is capable of accomplishing this insane task. I find the combination of dark backgrounds and polarized light very spectacular for transparent animals in general, and though that at least one object deserved such attention. Hope it was worth it. Hydras and daphnias became a "classical" pair of predator and prey model of pond microscopic animals. However, what is often forgotten, hydras tend to aggregate together in high numbers. Usually, the encounter is not like one hydra vs one daphnia. It's a real mess! During warm days it's possible to spot hundreds of these tiny hungry monsters on a single leaf laying underwater. Inevitably, they start competing for food. In this post I'll show how two hydras fight for a single water flea. Unlike in my other posts, the photographs are not made through the microscope. I tried Canon MP-E mounted on 7D for videography purposes, but made lots of stills during my project. May be these pictures will not impress you after previous hydra posts (1,2) but they show natural behavior. Some pond animals might not look attractive at first glance. 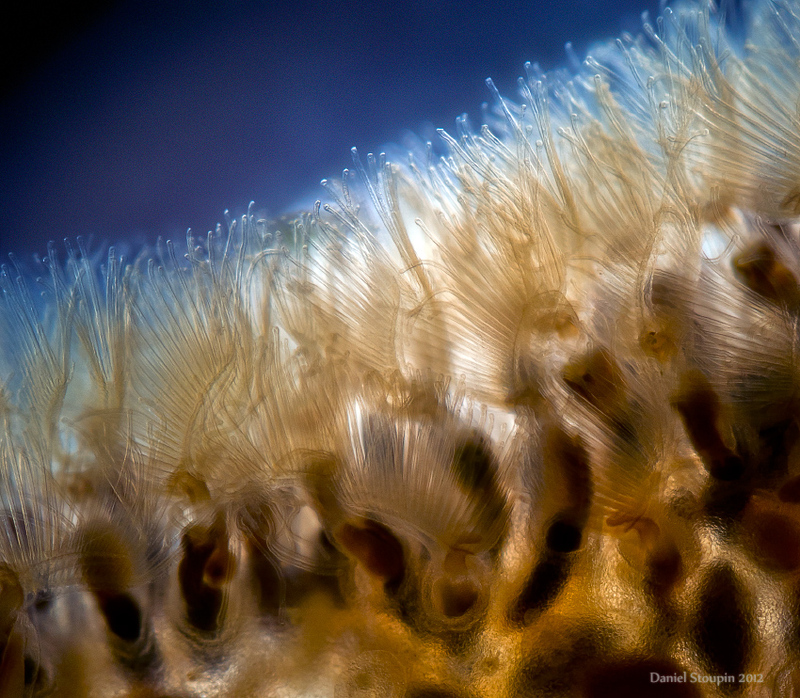 The majority of people who encounter a bryozoa colony most likely wouldn't recognize what it is. A hairy warm? A weird hydrozoa? After all, even the mention of words "bryozoa"and "moss animals" alone provokes only one question—"what the heck is that?" The truth is, molecular taxonomists have more or less the same question when approaching this group. Bryozoa are among the least studied invertebrates. 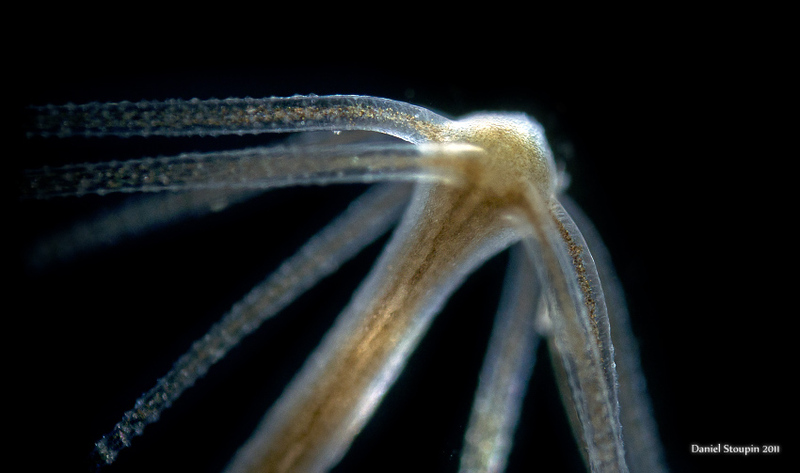 According to phylogeny analysis they are not relatives of cnidaria or, in fact, any known group of invertebrates. Some evidence suggests that they might be related to even less studied group of organisms—Entoprocta. But leaving phylogenetic and taxonomic speculations aside, bryozoa are colonial filter-feeding animals that are really abundant in freshwater and marine habitats. Their polyps are tiny and almost invisible to the naked eyes. Yet their colonies can reach up to several meters is size, although such giants are rare. Hydras are awesome dancers. They are very flexible and I could never get tired of taking pictures of all bizarre shapes and forms they take.